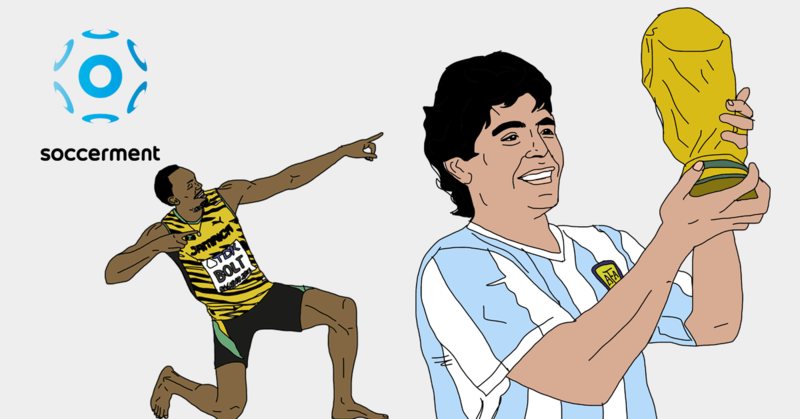 We analyse two categories of midfielders, the playmakers and the assist-makers. 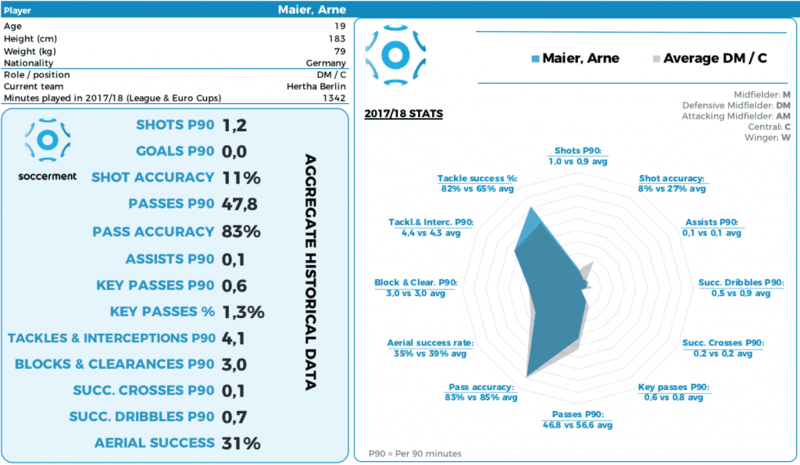 Regarding the first group, Verratti (PSG) displays the highest number of accurate passes per match in Europe, while Arne Maier (Hertha Berlin) the highest relative contribution to scoring chances. “Mr Throughball” Neymar shows the highest number of assists and expected assists per match. Viviani (SPAL) is the Maestro of long balls. 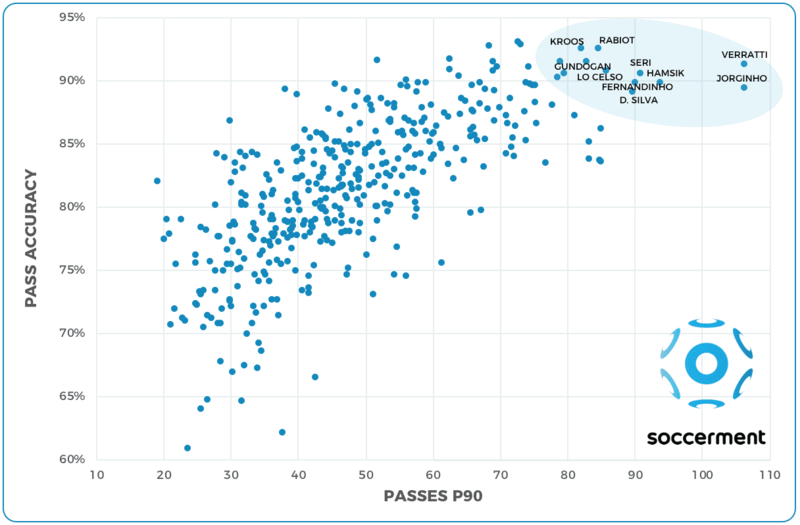 Passes represent between 70% and 80% of the total events in a football match. It is therefore crucial to assess them properly. 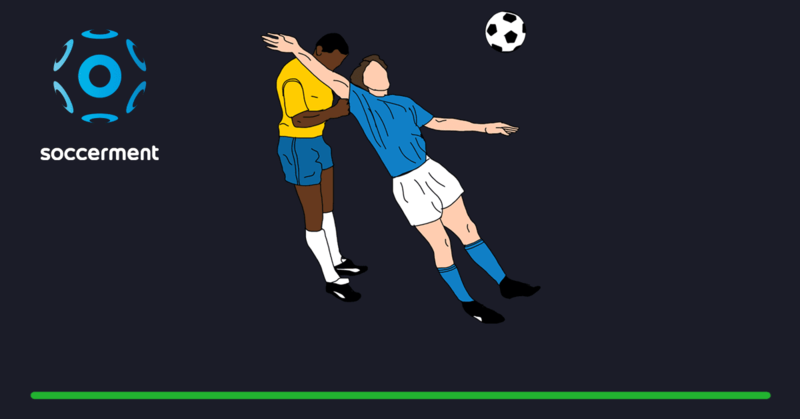 This is why we publish this add-on to our trilogy on ball possession (first part here, second part here, the third part will be published pretty soon). 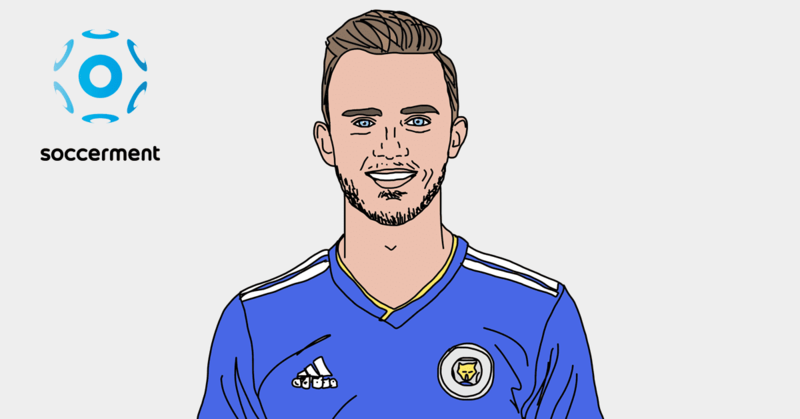 In this post, we dig into the individual characteristics of European midfielders, i.e. the players holding the keys of a team’s build-up potential. 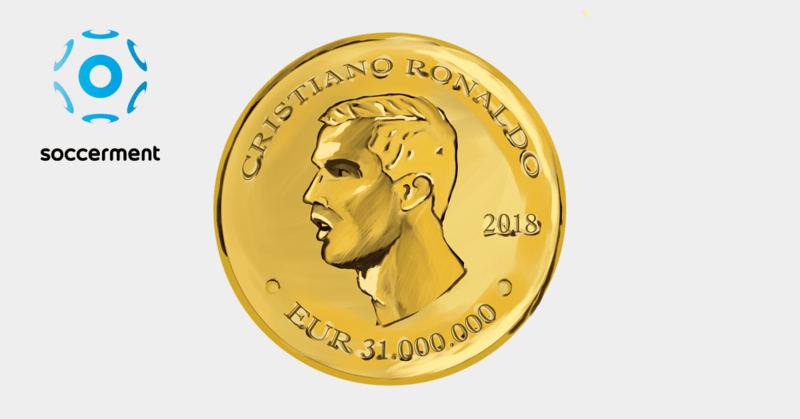 Our database comprises the midfielders playing in the five major leagues (EPL, SLL, ISA, GB, FL1) and in the top teams of Portugal, Netherlands and Turkey. We divide the post in two parts. The first one investigates the habits and the skills of the “Playmakers”, while the second part focuses on the “Assist makers”. This post is the “2018 edition”. We plan to publish a similar analysis once a year. We define as playmakers those midfielders who tend to control their team’s ball possession, organising the build-ups from their own-third. They often start directly from the defensive line, through the so called “salida lavolpiana“. The quantity and the accuracy of their passes define their playmaking ability. Let’ start from a very basic analysis. We select the players who: i) have played more than 900 minutes in their league; ii) make more than 80 passes per 90 minutes; iii) display a pass accuracy of at least 88%. We end up with 10 midfielders (see Chart 2 below). Well done to Jean-Michael Seri and Toni Kroos, the only players who, without being part of PSG, Napoli or Man City, make it in the top ten! Note to the future coach of the Italian national team: If you wish to dominate the ball, Jorginho and Verrati seem the right men to have. Stats like the number of passes and pass accuracy naturally favor those midfielders playing in possession-hungry teams. On top, these numbers do not capture the effectiveness of the playmakers’ passes. A player might go for a hundred lateral or backward passes and look good on these stats, while not being effective. In order to overcome this, we went a step further and looked at how the aforementioned midfielders influence their teams’ build-up, in terms of chance creation. Influencers. No, we are not referring to social media. In this paragraph, we have a look at who are the players having the highest influence in the build-ups of their respective teams. They might show low numbers on an absolute basis, but the contribution to their teams’ fate is anyway remarkable. We are looking at the “xG Build-up” per 90 minutes. The xG Build-up, basically, is the xGChain net of key passes and shots. It returns the total xG of every possession the player was involved with. We divide it by the team’s xG per match, to find the player’s influence over the team’s destiny. In the chart below, we find some established top midfielders, such as Barcelona’s Rakitic and Sergio Busquets, Özil and De Bruyne. However, there a few surprising names. 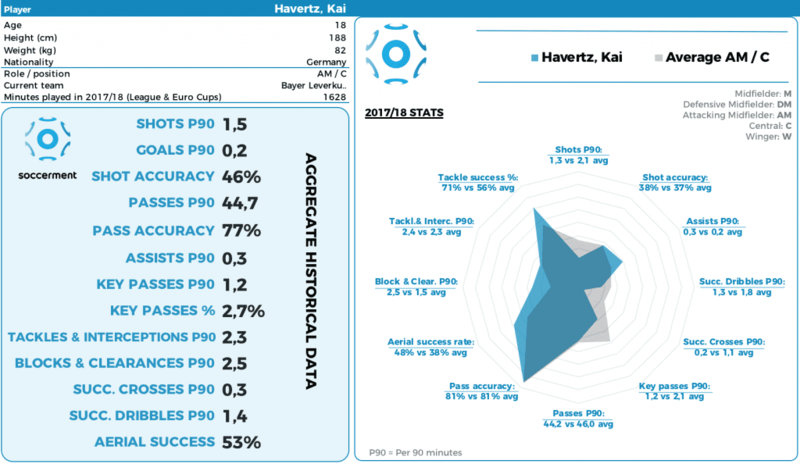 In particular, three youngsters: Arne Maier of Hertha Berlin, Fabian Ruiz of Real Betis and Kai Havertz of Bayer Leverkusen. At the end of this post, you can find the “cards” with the stats and the spider charts of all the surprising names we find during the analysis. Another exercise we did was looking at the top midfielders when it comes to long balls. 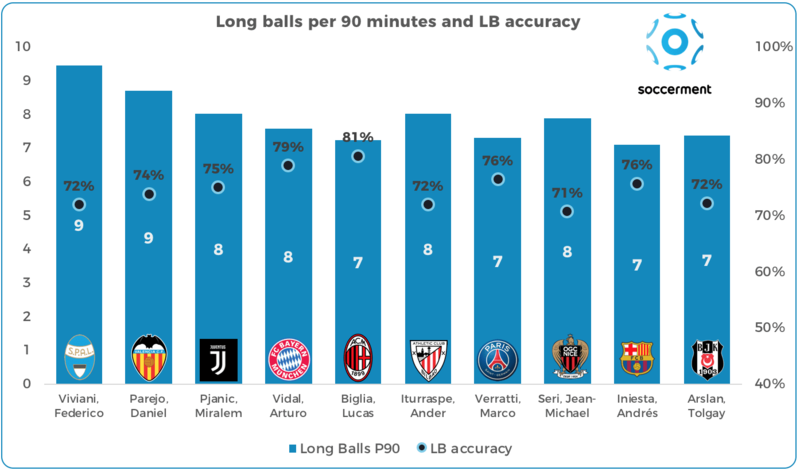 We selected, among the midfielders having played more than 900 minutes in the respective leagues, the ones trying more than 7 long balls per 90 minutes and with an accuracy of more than 70%. Here is the top ten. 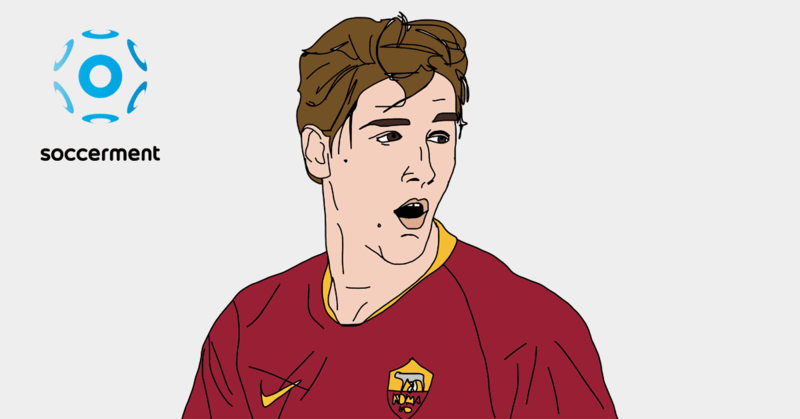 In Chart 4 below, again we find a few surprising names (like SPAL’s free-kick specialist Federico Viviani), as well as some confirmations (Andrés Iniesta). Man City’s De Bruyne and PSG’s Neymar have been the most productive assist makers in Europe so far, with 14 and 13 assists, respectively. With Neymar being out of contention due to injury, De Bruyne seems likely to be the top assist maker in Europe at the end of the season. 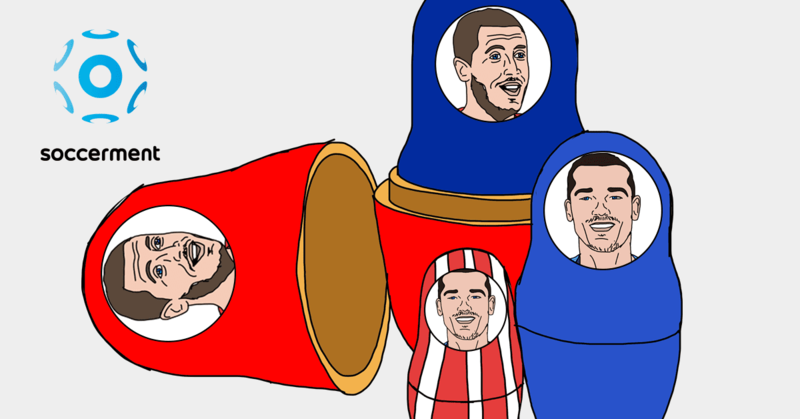 We investigated the top 5 leagues in Europe, plus we added the Primeira division in Portugal, Netherlands’ Eredivisie and the Turkish Super Lig. We inserted Neymar as an attacking midfielder here, although compared to many of the others players we take in consideration in this post, he plays much closer to the goal. 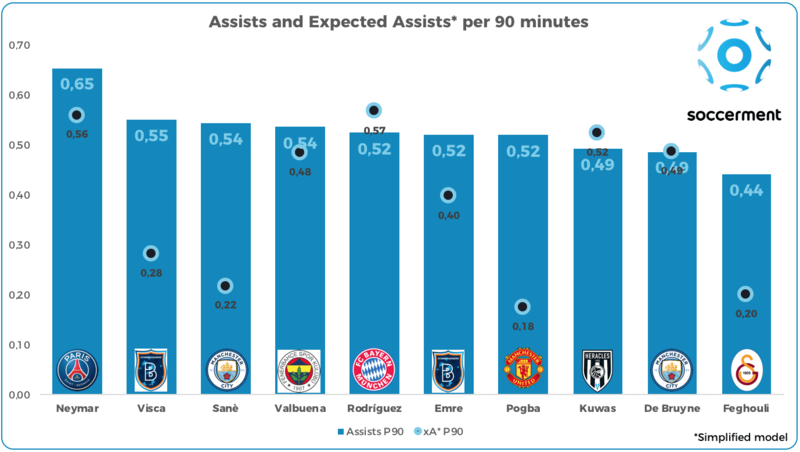 In terms of number of assists per 90 minutes (for midfielders having played >900 minutes in their league), Neymar tops the table (0.65), while De Bruyne is only ninth (0.49). In the second position we find Edin Visca, who plays in Turkey, for İstanbul Başakşehir, while in third position there is Man City’s Leroy Sanè. In the chart we also include a simplified version of Expected Assists (‘xA’), which in this case derives from the players’ key passes. Our model assigns a relatively high chance to a key pass delivered via a throughball to become an assist. Such a key pass diplays, in our database, a c.30% probability to become an assist. As a comparison, a key pass from a corner has a c.9% probability of turning into a goal. BOX 1. Why trying with direct corner kicks? The question is why football teams keep trying with direct corners? The average cross accuracy (for midfielders) is around 25%, which means that 3 out of 4 corners do not reach a teammate. 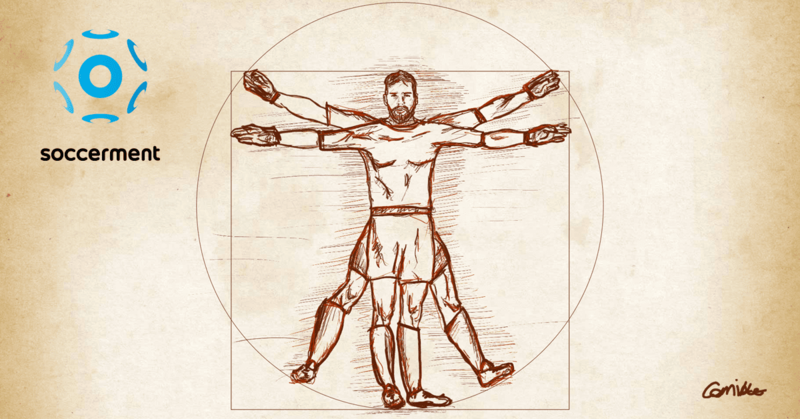 Furthermore, even when they do, the goal conversion is limited to 9%, which ultimately means that only 2 out of 100 corner kicks directly translate into a goal. The answer might be “going for the second ball”, but we are not 100% sure this is a rationale strategy anyway (similarly to crosses). Maybe worth an ad-hoc post. Meanwhile, we flag that the topic is dealt with in the book “The Numbers Game“, where the authors (Chris Anderson and David Sally) show that the correlation between the number of corners and the number of goals is basically zero. 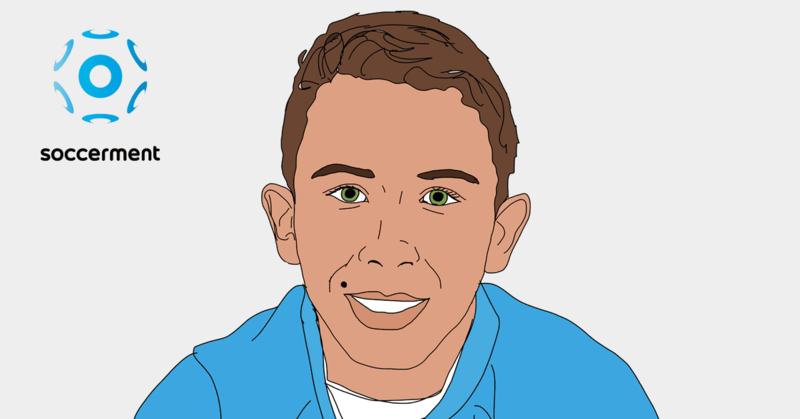 Going back to throughballs, we highlight the players who use the strategy “compulsively”. A common feature of these players is technique, very much needed to deliver an accurate throughball. We restrict the analysis to the midfielders (or attacking midfielders) who have played at least 900 minutes in their league. ‘Mister Throughball’ is Neymar Jr, who not only tops the rankings, with 0.81 throughball key passes per 90 minutes, but basically doubles the next in line. 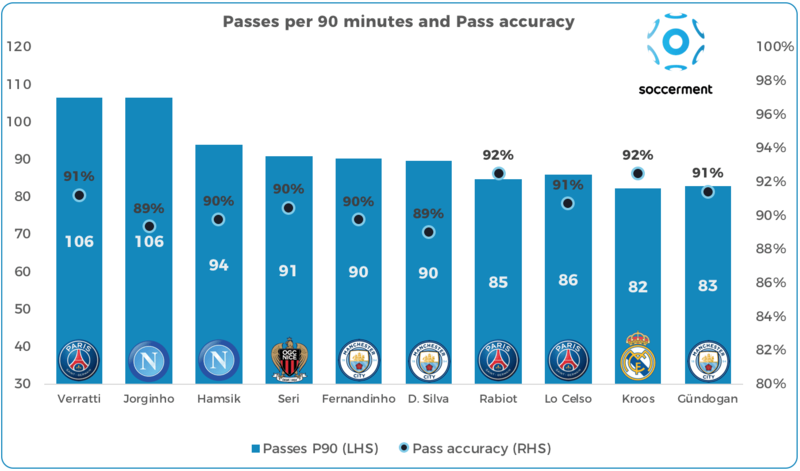 Marseille’s Dimitri Payet is second, with 0.42 P90, while Cesc Fabregas and RB Leipzig’s Naby Keita both show 0.4 throughball key passes per 90 minutes. In the chart below, the top-ten list in full. One word to describe it: quality. We started this analysis to see whether the numbers were able to give us some new angles and some less-obvious names. The answer is yes, as it normally happens with numbers in football. 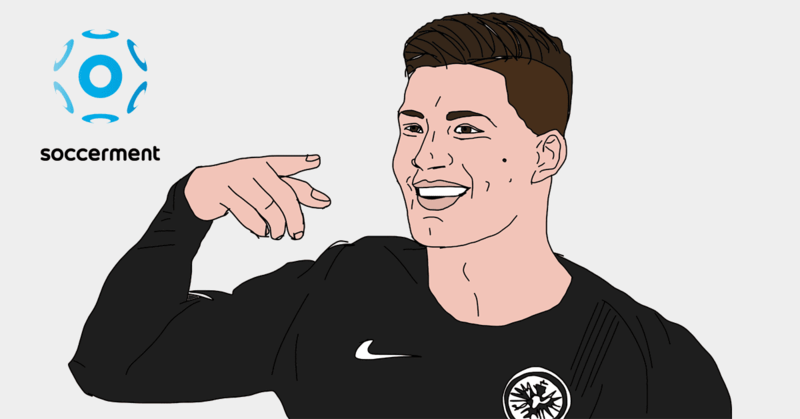 We discovered quite a few non-obvious names and started appreciating more some midfielders that, maybe, are currently not under the medias’ spotlight, but – we believe – are or should be under the radars of the top teams’ scouts. In this last paragraph, we share the stats-pack related to these players. Enjoy! For any comment, query or suggestion, do not hesitate to send us an email: research@soccerment.com.